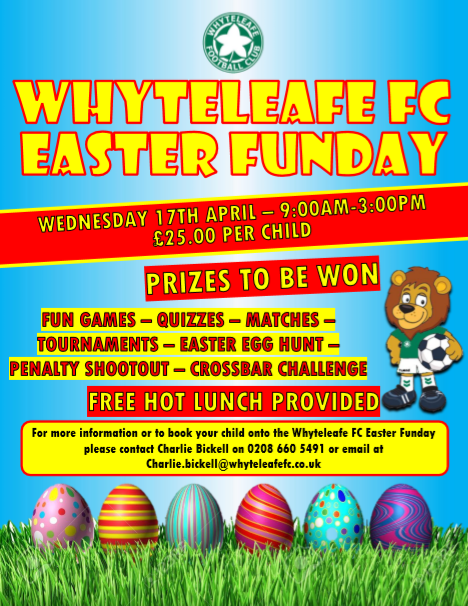 Whyteleafe Football Clubs Easter Fun Day is BACK! Our Easter festivities will be returning again this year with next exciting additions to the day and loads of fun leading up to Easter Day where the chocolate eating can begin. There are Easter Eggs on offer for the winner of the Penalty Shootout, Crossbar Challenge and our own Coaches Player of the Day. Thursday 17th April - 9:00am-3:00pm An excellent opportunity for you to do your last-minute Easter shopping. Our Easter Fun day will include football skill challenges, football quizzes, penalty shootout, matches and the return of our Easter Hunt challenge and much more. Only £25.00 for the day which will include a hot lunch (a choice of hot dog, pizza and chips). Book in advance to avoid disappointment. 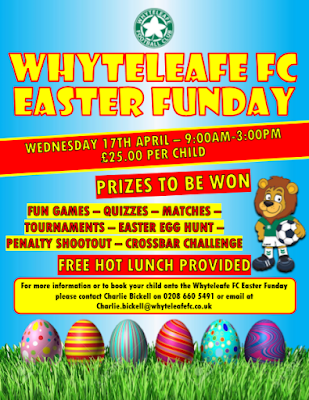 Contact Charlie Bickell on 020 8660 5491 or via email at charlie.bickell@whyteleafefc.co.uk. Sibling discount apply.